Oh, the new place has loose tea! I was so excited. 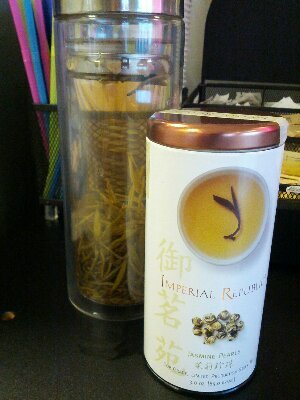 I busted out my loose tea travel mug and tried out the Republic of Tea Imperial Republic Jasmine Pearls. This is a really good jasmine tea. It doesn’t have a strong jasmine note to it, which is kind okay, it makes it a good mindless sipping tea. I prefer a bit more strength in the jasmine, but the green tea is a good quality base that it isn’t a bad thing, it just isn’t an in your face jasmine.